Ornate large-scale sconce with dragon motif attributed to Oscar Bach. Original polychrome finish. Iron and brass floor lamp with dragon motif. New mica shade, circa 1920s. Pair of outstanding Spanish Revival 1920s sconces with original polychrome finish and incised iron details. Attributed to Oscar Bach. 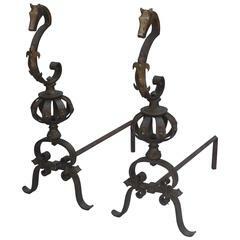 Measures: 12" H x 17.75" W x 6.25" D.
Finely crafted pair of andirons with whimsical seahorse design. Coordinates with fire tool set. French bamboo wall sconces attributed to Louis Sognot Torchiere shape with black iron arm. Newly rewired. Pair of elegant brass sconces with the Classic scroll arms and criss cross backs. French, 1940s. Can ship with the shades.